Data Center Cooling Market size was estimated at over USD 8 billion in 2016 and is predicted to grow at over 12% CAGR from 2017 to 2024. Increasing number of data centers across the globe to manage the rising enormous amount of data will propel the data center cooling market. The demand for the infrastructure is increasing from government agencies, large enterprises due to the adoption of advanced technologies such as big data analytics and cloud for business operational needs. The equipment helps the systems and processors from damages by removing excessive heat from the infrastructure. It also helps in providing a balanced temperature and control the humidity levels. The demand for environment friendly and cost-effective solutions is expected to drive the market growth over the forecast timeline. This is due to the power consumed by the equipment which is around 40% of the entire energy consumption. Ensuring optimum cooling not only reduces the operational expenditure, but also extends the lifespan of the hardware and increasing apparatus uptime. Advanced technologies such as liquid immersion cooling is being adopted to reduce the power consumption costs. The high costs associated with the manufacturing, installation, and maintenance of the equipment is hindering the growth of the market. Although the players in the industry are providing supreme quality systems to the customers, power flows leading to incorrect installations, and unreliable power sources pose a growth challenge. 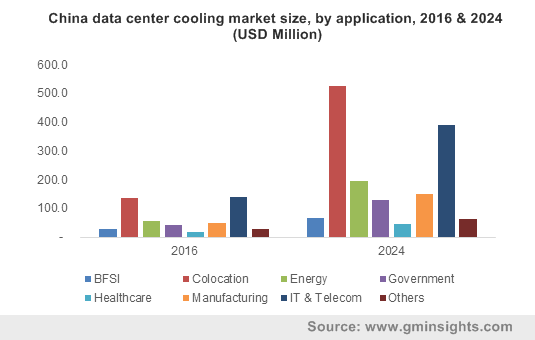 The demand for data center liquid cooling solutions is anticipated to witness a significant growth over the forecast timeline owing to the usage of advanced coolants which offers efficient cooling and also minimizes the total carbon footprint. The ability of liquids to deliver much more efficiency in comparison to air and the use of self-contained systems integrated with heat exchangers is increasing the demand of liquid data center cooling market. The maintenance services will grow substantially in the market. Several players in IT industry are engaging with the service providers to help manage data center optimization and maintenance. The service providers help in the management of converged infrastructure, physical servers and the storage which enables reliable and scalable infrastructure for the data availability and performance. Moreover, they aid in managing the facility across networks, on cloud environment and on premise storage. The rack/row based cooling technique is expected to grow at the highest growth in the data center cooling market owing to the ability to provide precise conditions in close proximity which is targeted at the banks with server cabinets. These systems can be easily suspended from overhead or installed on the floor keeping them closer to the racks or rows. Therefore, offering both efficiency and capacity gains. The technique also helps in reducing the cost by eradicating the conventional designs such as raised floors for the distribution of air in the infrastructure. The IT & telecom end-use vertical dominated the data center cooling market in 2016 due to the rising digitalization and penetration of technologies such as big data and cloud. These technologies pose an increasing demand for data storage and availability. Enterprises are demanding better data storage, connectivity and IT facilities to cater the demands efficiently. The proliferation of smart devices and consumer demand to safeguard the information property and financial assets is anticipated to drive the demand for cooling equipment. IT industries are actively adopting data center market solutions due to its high efficiency and cost-effectiveness benefits. For instance, In India after the introduction of Start-up India Stand Up India initiative and Digital India campaign, has witnessed an increase in the number of IT industries which has augmented the demand for the infrastructure in the country. The North America data center cooling market dominated the industry in 2016 due to the presence of technology giants such as Facebook, Google and Microsoft who are constantly seeking new ways to manage their rising data. Escalating growth in web-based services and need for highly efficient data storage capacities has put a substantial load on the national power systems fueling the demand for efficient systems in the market. In addition, the regulatory bodies such as the American Society of Heating and Refrigeration and Air-Conditioning Engineers (ASHRAE), has updated standards for the humidity and temperature conditions for computing equipment. 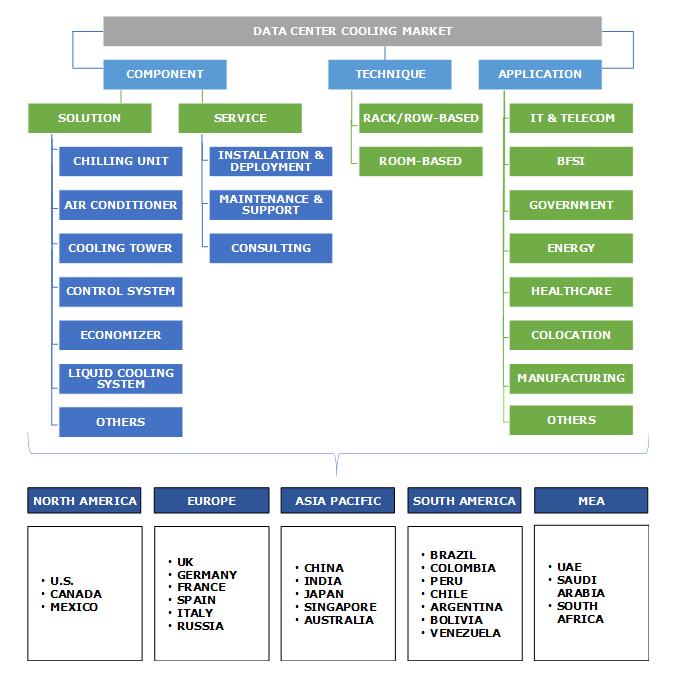 The vendors in the data center cooling market include Schneider Electric SE, Black Box Corporation, Nortek Air Solutions, LLC, Airedale International Air Conditioning Ltd., Rittal GmbH & Co. KG, and AdaptivCOOL. The companies are focusing on new product developments and acquisitions as the prime strategy to remain prominent in the market. This enables the companies in accessing the hands-on technological expertise of other companies. Furthermore, they are also catering to different needs of the customers based on the infrastructure designs in various end-use verticals. As data centers consume more energy to meet rising demand from both businesses and consumers, cooling has become a major cost factor. The prospect of rising energy prices and more-stringent government regulations is also driving operators to reduce consumption. The players provide a vast array of equipment to cater to the varying demands of the end-user based on the financial budgets and types of equipment required. Industry is focusing on green cooling strategies to deliver efficient cooling solutions minimize the power consumption levels and enhance the performance. Rising data volume has created demand for the rise in data storage space, so that data can be stored and processed safely. In addition, the increasing data processing necessitates more systems to enable smooth functioning of the data storage server which will propel data center cooling industry demand.